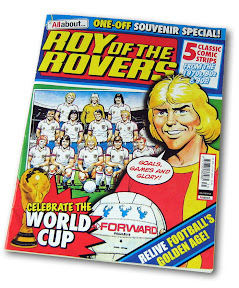 (Via Lew Stringer and others): Egmont is joining in with the World Cup mania gripping the UK with the release of a 52-page full colour comic, All About Roy of the Rovers, which joins Titan Books fab new Roy collection as a couple of ace football goodies now on sale. The publication is the latest of Egmont's regular All About... series, which are normally feature-driven so this Roy of the Rovers special is something of a novelty. 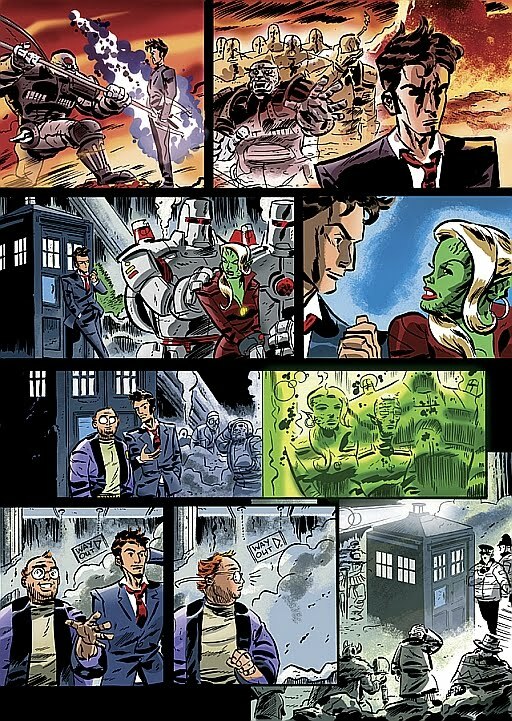 Lew Stringer reports there are five comic strips in all over on his ace Blimey! It's Another Blog About Comics blog, selecting material from the late 1970s to the 1990s. The issue kicks off with eight consecutive parts of a 1978 Roy of the Rovers story concerning Roy Race forming an England squad that includes real-life 1970s footballer Trevor Francis and, in a rare UK comics crossover, Nipper Lawrence (from Tiger's long running Nipper strip). The art is by David Sque, now the artist on the Mirror's Scorer strip. (David drew the Roy of the Rovers story from January 1975 to August 1986). Two other Roy of the Rovers stories are included which, at eight pages in length each, possibly from old annuals or specials; a four part Goalmouth story by Tom Tully and John Cooper; and a four page Andy Steel Playmaker story by H.Manning and G. Marchetti. "Football isn't really my thing and I hardly followed the old Roy of the Rovers comic at all but this is a very nice collection of strips," Lew enthuses. "The format is glossier than the Egmont Classic Comics of last year and I'm pleased to see the strips are more complete rather than the open-ended choices of those Classic specials." Titan Books also have an ace Roy of the Rovers: World Cup Special out now - which includes work by the great artist Joe Coloqhoun, who's perhaps better known these days for his stunning art on strips such as Charley's War and the early Johnny Red strips. This lovingly put together title - hats off to series editor David Leach for another gem! - includes stories from four different decades as Roy Race strives to help England to relive the past glories of the 1966 World Cup. Whether it's leading the British B team, or taking part in qualifiers, Roy was always at the forefront. The story of Roy's trials and tribulations in Australia, pitted against increasingly violent opponents both on and off the field, is simply priceless! Back at Egmont, the latest issue of TOXIC continues the World Cup theme with a selection of World Cup Funnies alongside the usual assortment of strips and daft features. That's on sale now and comes with three free gifts. • All About Roy of the Rovers is £3.99 and will be on sale from 16th June to 13th July. UK publisher Mohawk Media has released a teaser image following its acquisition of the license to produce original adventures of Tough Guy. Tough Guy, the British publisher’s first title since the top-selling official Mr. T graphic novels, is written by Chris Bunting (Mr. T; Action Man) and illustrated by Steve Beckett (Beano Annual; General Jumbo). Competition: Win a Rude Britannia Book! 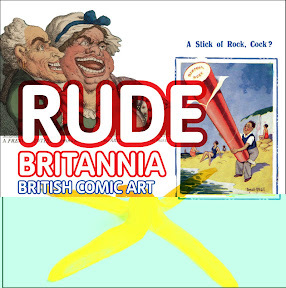 Marking the launch of the Rude Britannia Exhibition at the Tate, downthetubes has THREE copies of the tie-in book - Rude Britannia: British Comic Art by Martin Myrone, Tim Batchelor and Cedar Lewisohn - to give away! Comic art - art that gains its effect through visual humour, caricature, exaggeration and slapstick, whether in print, reproduction or through the moving image - has long helped shape and inform British culture. Martin Myrone is Curator (18th & 19th Century British Art), Tate Britain and is the author of The Blake Book, Henry Fuseli and George Stubbs. Tim Batchelor is Assistant Curator at Tate Britain and Cedar Lewisohn works for Tate Media and is the author of Street Art. HOW TO ENTER: Simply answer the question below and send us the answer by e-mail to johnfreeman6-tatebritaincomp@yahoo.co.uk to arrive by 12 noon on Friday 25th June 2010. Please include a contact address. Sorry, UK readers only, due to postage costs! Three winners with the correct answer will be drawn at random from the downthetubes straw hat by the office cat and the names will be published on the web site. • Which British national newspaper publishes Steve Bell's "If" comic strip? The 9th Bradford Fantastic Film Weekend was held at the National Media Museum from 4 to 6 June. The annual event began in 2002 as a celebration of classic ghost stories and the supernatural and has evolved into a major celebration of horror, sci-fi and fantasy TV and film. Modern films included the excellent 28 Days Later and 28 Weeks Later shown as a double bill and I was also pleased to see eXistenZ, a film unfamiliar to me but which is very thought-provoking and clever and, like 28 Days Later, features Christopher Eccleston. 2009's Shadow, directed by Federico Zampaglione, was very intense, very gory (as in Saw levels of gore!!) but also wonderfully political, topical and very intelligently made. There was also a selection of short films - these included The Cicerones (featuring Mark Gatiss visiting a creepy church to view a painting) and Full Employment (which was so funny it had to be seen to be believed). There was also no shortage of vintage material including the classic Matthew Hopkins Witchfinder General, a beautiful digital version of Psycho (superb in every way) and The Giant Spider Invasion, one of those 'so bad it's good' movies which the audience loved and which featured a giant spider that looked like a prop from The Goodies!! A highlight for me was Three Cases of Murder, a wonderful British film from the 1950s which consisted of three self-contained stories, including a wonderfully spooky tale of an artist who emerges from one of his own paintings and drags a museum worker into his sinister world. The FFW team always do a great job of digging out rare, overlooked films such as this. In addition to these amazing films, there were two special guests in the form of director/cinematographer Stanley A Long (who worked with Boris Karloff on The Sorcerers) and writer/director Michael Armstrong (Mark of the Devil). I missed Michael's talk but saw Stanley's and he was absolutely fascinating and very popular with the audience. The whole event was held together by festival director Tony Earnshaw who gave fascinating and humerous introductions to many of the movies. His insights set the scene for each film. He was well supported by the museum staff who were very helpful and friendly. In fact, the whole event had a very friendly atmosphere with a group of like-minded people coming together to enjoy great films. Opening today at Tate Britain in London is the new exhibition 'Rude Britannia', which traces the history of British comic art from Hogarth to the present day. In an hour-long Clear Spot radio show from the Strip! radio show team, looking at the art on display and related topics, you'll hear an extract of a tour of the gallery conducted by curator Martin Myrone. Along with one of the contributors to the exhibition - Gerald Scarfe - he'll be talking to Alex Fitch about the choices that went into curating the show and the crossover between fine art and 'low brow' satirical drawings. Alex also talks to cartoonist Martin Rowson - who is currently exhibiting his illustrations for New Humanist magazine at Menier Gallery (51 Southwark Street until 12th June) - about his adaptation of the humorous and experimental Eighteenth century novel The Life and Opinions of Tristram Shandy, Gentleman into graphic novel format. 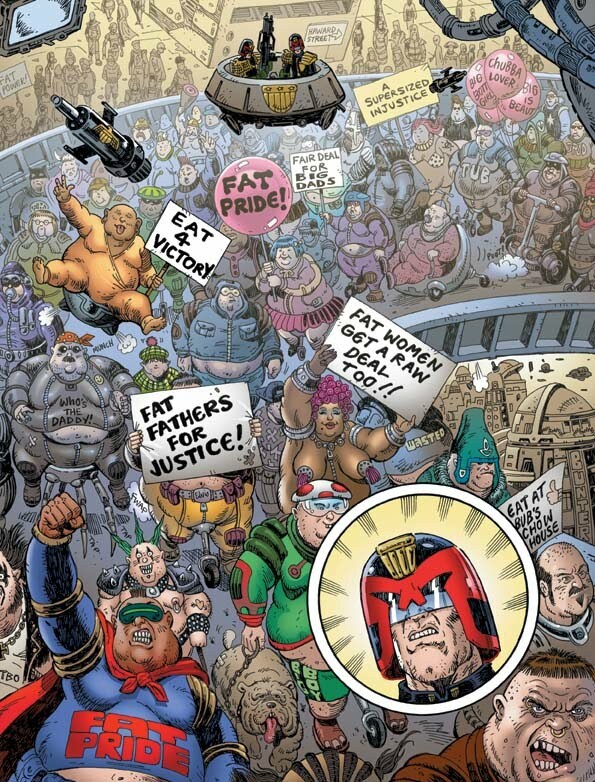 Sneek Peek: Fat Fathers versus Judge Dredd! 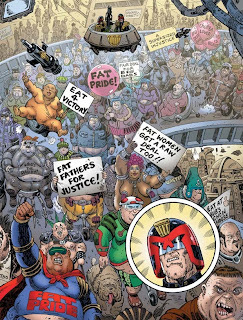 The Mighty Tharg has allowed comics artist Jon Haward to show a page from the upcoming Judge Dredd: Fat Fathers story, written by John Wagner, which will feature soon in 2000AD. Drawn by Jon about 12 months ago - talk about working ahead! - with colouring by Chris Blythe, "I was drawing in in a tribute style to Mick McMahon," Jon reveals. "This page took me three days to draw but was such a laugh drawing it -- see if you can spot [my Wasted character] Buddha in the crowd." 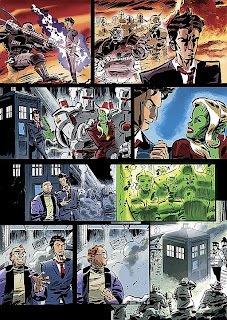 Over at the Forbidden Planet International blog, downthetubes contributor Matt Badham (that's me) talks to cartoonist Dan McDaid about his work on the comic strip in Doctor Who Magazine and Image Comics' Jersey Gods. In the interview, Dan reveals what finally made him pursue his dream of working as a comics writer and artist. "I’m optimistic about comics as a medium – I think graphic novels do well in bookshops now and kids really do like reading them – but I don’t know whether there is an ‘industry’ anymore." "The event is scheduled for Sunday the 20th of June at the Impressions Gallery on Centenary Square, with evening shenanigans to follow at the 1 in 12 Club on Bradford’s Albion Street afterwards; check the sites or contact them at bradfordzines (at) hotmail dot co dot uk for more details or to take part." "The thing with British shows is that there's very few that I actually want to attend nowadays. Previous trips to Bristol and Birmingham have been expensive and without much reward as they're catering for a mainstream, diehard comic audience who are very happy to pay £12 a day just to get into the venue."